12:32pm on the square of the Quartz : Let’s go ! Young colorful acrobats, dancers and sportsmen ran in the streets of Brest. 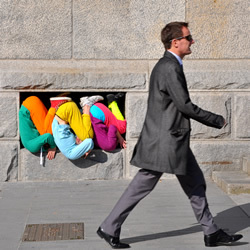 During one hour, the performers played hide and seek, redefining the contours, the forms and monuments of the city, providing the city dwellers an opportunity to look at the walls with a new sight. The audience started to look for these urban contortionists, and a succession of images appeared each more crazy than the last, ephemeral artworks. First body found ! They appeared on the Quartz, in red, green, violet and horizontal. On the other side of the Clémenceau’s boulevard, pink bottom and white trainers appeared under The Dialogues enfants’ sign. A little further, six more bodies, put in a line on one of the Place de la Liberté’s stairs. Right next to it, head resting on the ground, a yellow fluorescent body is stuck in the armrest of a bench, as a thread in a needle, stand up, still. Two benches further, the same in orange. A hole on the Post office’s façade : inside, three bodies embedded. The Siam and Colbert’s streets are joined with a red and yellow ’square of bodies’. This is so sad a parking meter…Suffering from loneliness and rejected by the population, apart from the coins, the parking meter only receives injuries, dirty look at best indifference. But today, the parking meter’s destiny from Brest changes for a moment. The lucky winner was comforted by a body, catching for the first time the eye of passersby…an art work for few seconds. A little lower, the old horse carousel has been decorated with a multi-coloured ’tinsel of bodies’. It seems that the top of the Saint Louis Church changed : figures sat and huddled together, have climbed one of the fronts, creating a human chain. From both sides of the Siam Street, the figures continued to play, ‘sowing’ the audiences, surprising them in the most unusual places : hanging in the trees, wrapped around traffic lights, a twenty four-leg caterpillar in the stairs, behind a post box, or here on the pavement, tangled with each other, forming a human mound : feet, arms, heads and legs appeared here and there. The final took place on the brand new Recouvrance’s bridge. The holes of the bridge seemed to be made for them ! After having posed for a few minutes, between cars in flowing traffic, the game of hide and go seek ended with cheers.